A symbolic effort devoted to the cause of human advancement. anskriti is called ‘Culture’ in English. Though culture does not express the full meaning of the term Sanskriti, yet it is the nearest possible word. Since there is no exactly parallel word of Sanskriti in English language, it i.e. ‘culture’ is used to express Sanskriti. Bodh is enlightenment. It is the highest achievement in a particular field of knowledge. When one attains bodh, nothing else remains to be known. It is the final stage of acquisition of knowledge or realization to be more specific. Sanskriti is such a kriti (creation/endeavour), as is beneficial and favourable for all round ( physical, intellectual and spiritual) advancement of human life towards attainment of the highest objective. 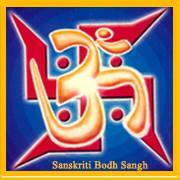 The Sanatana Sanskriti, is also known as Eternal Culture. It is based on eternal Laws of Nature, values, truths and principles perceived by Indo-Aryan Rishis in their purest and highest state of mind, through distinctive disciplines of Yoga, elaborated and systematized by enlightened Masters, who had reached pinnacles of perfection. 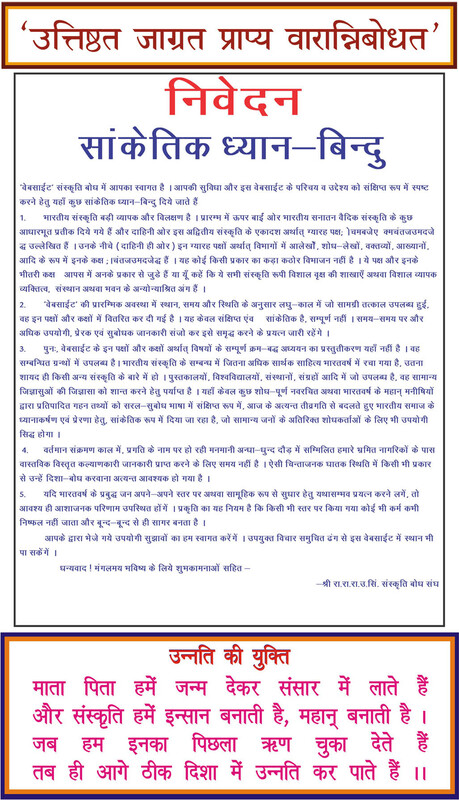 These have been tried and tested down the millenniums by succeeding generations, taught by great Guru-Ghars ( illuminating institutions ), practised by enlightened progressive persons with unique achievements and propagated by sagacious scions of notable Gharanas, families and groups, who have created history. The Sanatana Sanskriti of India has roots in the Vedik ideology. The Vedas are the earliest literary works of the world. Many cultures grew, developed and vanished, due to one reason or another, on various parts of the globe. But, the Sanatana Vedik Sanskriti of Bharata Varsha has continued till the present times. Though it is the oldest culture of the world, yet after seeing numerous ups and downs down the millenniums, still continues to exist. The Sanatana Vedik Sanskirti of Bharata Varsha is a wholesome culture. It is favourable to multi-sided growth and conducive to essential development in all desirable fields of human advancement, which have been broadly divided into four major groups ― Dharma, Artha, Kama and Moksha. Most of the other cultures of the world deal with only two aspects e.g. Artha and Kama, which are not sufficient for wholesome development of the human race. Development of only Artha and Kama can not meet full requirement and leaves the aspirers dissatisfied in the end, because many desires still remain unsatisfied. Desires go on increasing and push the seekers into a vicious circle, where there is no end. To meet the total requirement, two more aspects i.e. Dharma and Moksha need to be covered to reach the stage of complete satisfaction or contentment .All of these four most essential aspects for human advancement are covered only in the Indian culture ― the Sanatana Vedik Sanskriti . Sanskriti has to be kept pure. It has to be preserved, propagated and carried forward at all costs. Its values have to be nourished and kept alive. A family, a race or a nation does not lose much if it loses materially. But, if it loses its history, its culture, its traditions and values, it loses every thing. The value of culture or cultural heritage can not be measured in monetary terms. It is invaluable. It the modern times, we are face to face with dangerous multi-pronged attacks from the outer world. We are entangled in a whirlwind of socio-cultural confusion. The cultural invasion from the outer world is proving fatal for our millenniums old time-tested distinctive culture, which has survived the onslaught of many a tyrant in the past, but seems now to be on the verge of collapse. What we maintained and kept intact during centuries of foreign rule, we are tending to lose completely under our own elected governments. Anticipating the present situation, Raorsi Rajguru Sri Rao Uttam Singhji, had, in the first quarter of the preceding century, initiated and carried out a sort of crusade for the cause of cultural conservation, which he continued through out his life time in his own way. Towards pursuance and advancement of the noble cause initiated by him and spreading the light of the flame ignited by him, his disciple and son Sri Rao Vijay Prakash Singhji, popularly known as Sri V.P.S. Rao, has been trying to contribute in his own ways, which include production of literature also. There is a dire need of introspection and retrospection and take effective steps to preserve, propagate and develop our great and distinctive culture, says Sri Rao. He adds that in the process of conservation, while, on the one hand, we need to preserve our cultural remains ; there is, on the other, an equally important need to encourage study, research, awareness, understanding , practice and nourishment of the tenets and develop and maintain taste for all that belongs to our culture, the Sanatana Sanskriti. Action is the result of thinking and thinking is the result of awareness. Awareness is the gateway to enlightenment. To create and encourage awareness is the aim of the Sankriti Bodh website. ― Sri R.R.R.U.S. Cultural Awareness Group. Sri RRRUS Cultural Awareness Group ( श्री रा.रा.रा.उ. सिं. संस्कृति बोध संघ ) is a non –political, social and educational group,devoted to preservation and propagation of Indian culture for welfare of humanity. 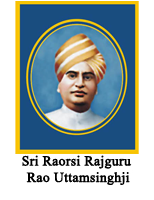 The Grand Oriental Master Sri Raorsi Rajguru Rao Uttamsinghji , ideal educationist, humanist , numismatist, connoisseur of fine arts , symbol of self-realization and multi-dimensional source of inspiration. Sanatana Sanskriti-Ratna Sri Rao Vijay Prakash Singhji , eminent spirituo-cultural luminary, multi –dimensional litterateur, prolific author, editor, columnist, humanist with compassion for all, conscientious social-reformer, treasure of knowledge, a full-fledged institution in himself, valuable advisor, broad-minded large-hearted guide, devoted missionary and a source of inspiration for others. 1.Free jewels as offered here. 2.Priced publications to meet the expenditure. (D) Associate members. For membership, requests along with profiles may be addressed to the Secretary. Queries, if any , may be addressed to the Secretary , Sri RRRUS Cultural Awareness Group.